Walking by the Champs-Élysées you will find many options of restaurants and bakeries, including Five Guys. Honestly a funny choice in the middle of the capital of high cuisine but there it is. Definitely not tempted by an American hamburger, we walked thought the streets looking for real food. 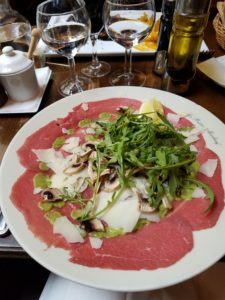 We were not disappointed on this restaurant that we found by chance because the food was delicious and the staff very friendly that accommodated us in English and for a change that felt nice. 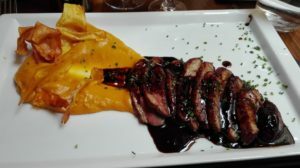 And the Magret de canard et sa purée de patates douces –Duck breast with sweet mashed potatoes…. The place is very pretty with a nice atmosphere and the prices not bad for the area we were in. We recommend it.